Wishing you all A Very Happy and Prosperous Shri Krishna Janmashtami. 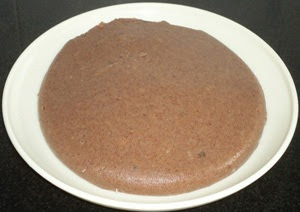 Raagi manni or nanachane manni recipe - Raagi manni or nanachane manni is a delicious soft sweet prepared with finger millet flour, jaggery and coconut milk. Raagi manni is a traditional konkan cuisine prepared during Jnmashtami and offered as naivedya to Lord Krishna. Traditionally, finger millet is soaked for eight to ten hours and grind to paste. Then strain it in a large vessel through a muslin cloth and the finger millet paste subsides when the water becomes calm. 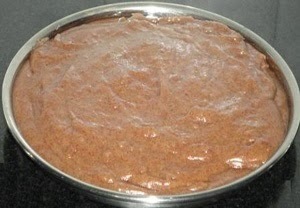 At this stage water is carefully drained and the paste is used to make raagi manni. But I don't follow this lengthy process. I use finger millet flour to make the raagi manni. Friends, try out this delicious raagi manni to treat your family and friends. 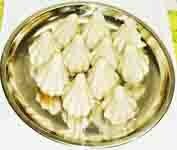 Finger millest are rich sources of calcium and it has cooling effect on body. Therefore finger millet must be included in the diet. Take 2 cups of cold water in a large bowl. Add 3/4 cup of jaggery to it. 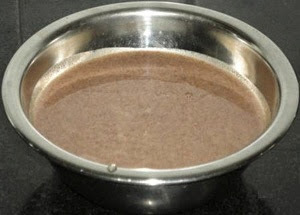 Dissolve the jaggery in water, stirring with a spoon. Add a cup of finger millet flour and coconut milk to it. Mix well. Transfer this flour mixture to a heavy bottomed vessel and keep it on a medium flame. Cook stirring continuously till the flour mixture becomes thick and leave the edges. Chances of forming lumps is possible. To avoid it stir continuously. Before removing from the flame, add 2 tsp of ghee and cardamom powder to it. Mix well. Grease a plate with little bit of ghee and transfer the mixture to the plate. Keep the plate in the refrigerator for 2 hours or till the manni becomes firm. 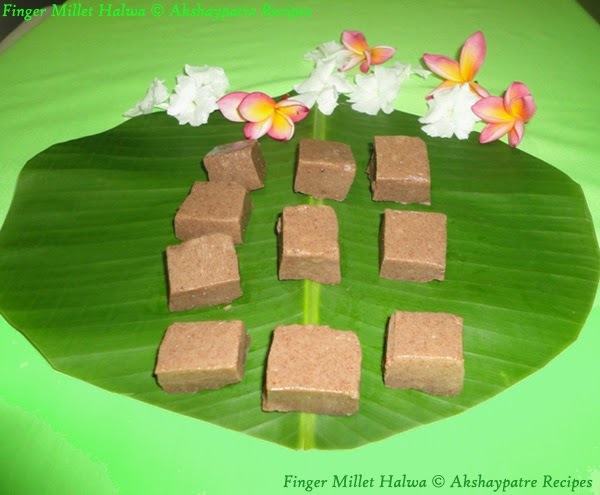 Cut the ragi manni into square shape and offer God as naivedya and serve as prasad. 1. Take 2 cups of cold water in a large bowl. Add 3/4 cup of jaggery to it. Dissolve the jaggery in the water, stirring with a spoon. 2. Add a cup of finger millet flour and coconut milk to it. Mix well. 3. Transfer this flour mixture to a heavy bottomed vessel and keep it on a medium flame. 4. Cook stirring continuously till the flour mixture becomes thick and leave the edges. 5. Before removing it from the flame, add 2 tsp of ghee and cardamom powder to it. Mix well. 6. Grease a plate with little bit of ghee and transfer the mixture to the plate. Keep the plate in the refrigerator for 2 hours or till the manni becomes firm. 7. 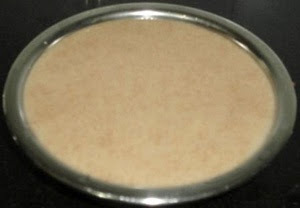 Cut the ragi manni or nanchane manni into square shape, offer God as naivedya and serve as prasad. wow thats an very healthy and delicious looking halwa :) looks yumm dear !! healthy halwa. see you some times at my space. 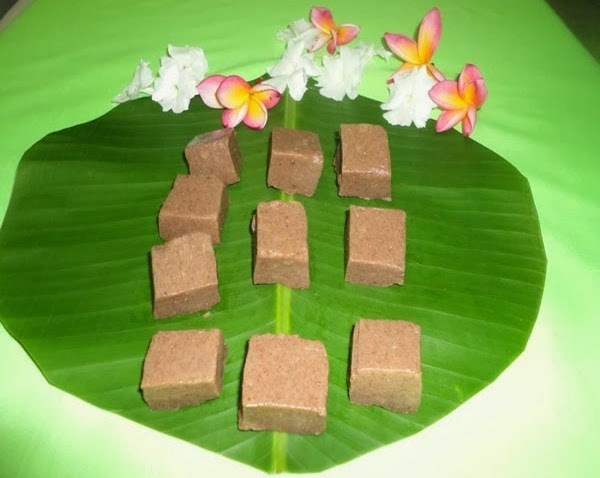 Healthy halwa,authentic recipe..thanks for sharing. Omg, wat a healthy halwa, never had this halwa, looks fantastic and makes me drool. Very healthy and delicious halwa...nice attempt. They look yummy and sweet!